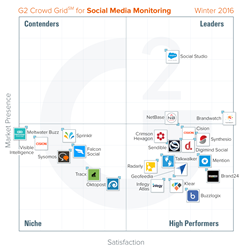 G2 Crowd, the world’s leading business software review platform, today released the Winter 2016 Social Media Monitoring Software GridSM report to help businesses make the best technology decisions. Social Studio, Brandwatch and NetBase were named Leaders in the report, receiving strong customer satisfaction scores with large market presence scores. Additionally, 13 products were named High Performers, with Brand24, Mention, Synthesio and Digimind Social earning the strongest customer satisfaction scores with smaller market presence scores. Brandwatch earned the highest overall satisfaction score while Social Studio had the highest overall market presence score. The GridSM leverages customer satisfaction data reported by authenticated users along with vendor market presence determined from social and public data. Based on a combination of these scores, each software solution is categorized as Leader, High Performer, Contender, or Niche. Overall, social media monitoring software feature satisfaction ratings for the highest scoring product in each category were extremely strong. Brandwatch earned the highest rating of all Leaders at 97 percent, Brand24 earned the highest High Performer satisfaction rating at 89 percent, and Oktopost was rated the highest satisfaction score of all Niche products at 47 percent. Social media monitoring platforms generally offer features including social listening, measurement, sentiment scoring, influencer identification, and social reporting. Key findings revealed that across the category sentiment scoring features rated low, with a category average of 74 percent. Users were vocal with their disappointment, and hoped social media monitoring products would adopt new natural language processing technology. In contrast, users enjoyed filtering options such as geolocation, language, age, as well as pre-built and customizable queries to help filter their data. There have been several notable changes in the refreshed Winter 2016 GridSM, including newcomer Social Studio, which appeared in the report for the first time as a Leader. In addition, NetBase experienced a dramatic change, as it moved from Niche to Leader, as its satisfaction score increased by 55 points and its market presence score increased by 14 points. Also of note is Synthesio’s satisfaction score, which increased by 16 points, while its market presence score increased by 11 points. ● The report is based on more than 830 reviews written by business professionals. ● Of the roughly 100 products listed in G2 Crowd’s social media monitoring category, the ranked products each received 10 or more reviews to qualify for inclusion on the GridSM. ● There were 12 new products added to the Winter 2016 Social Media Monitoring Software GridSM, including Social Studio, Sendible, Brand24, Talkwalker, Infegy Atlas, Tracx, Klear, Falcon Social, Visible Intelligence, Buzzlogix, Sprinklr and Oktopost. G2 Crowd, the world’s leading business software review platform, leverages its 50,000-plus user reviews to drive better purchasing decisions. Technology buyers, investors, and analysts use the site to compare and select the best software based on peer reviews and synthesized social data. Co-founded by the founder and former executives from SaaS leader BigMachines and backed by roughly $12 million in capital, G2 Crowd aims to bring authenticity and transparency to business technology research. For more information, go to G2Crowd.com.